3DMEDiTech is an Australian-Israeli company which develops and delivers mass-customised medical devices utilising 3D printing. We do this by re-engineering analogue medical devices which are high volume and will clinically and commercially benefit from the complete digitisation and automation of the design, customisation, fabrication and supply-chain processes. Our SmileStyler system is a world first completely digital, 3D printed clear aligner. Our serkel division is delivering precision-customised prosthetic orthotics such as plagiocephaly helmets and ankle foot orthotics. Prevent, via hand hygiene and environmental cleaning products that meet International, National and State guidelines. Control, with a range of premium drapes, dressings, and wound management solutions. Assure, with state-of-the-art sterilisation monitoring and auscultation products for results you can count on. Abbott Vascular, a division of Abbott, is a global leader in cardiac and vascular care with market-leading products and an industry-leading pipeline. We are committed to advancing patient care by transforming the treatment of vascular disease through medical device innovations, investments in research and development, and physician training and education. Admedus is a diversified healthcare company with activities that are focused on areas of medical need to help patients who currently suffer reduced outcomes that adversely affect their quality of life. As the global leader in eye care, Alcon develops and manufactures innovative medicines and devices to serve the full life cycle of eye care needs. Allergan is an industry leader in Open Science, the Company’s R&D model, which defines our approach to identifying and developing game-changing ideas and innovation for better patient care. Analytica Limited is a Brisbane-based public company listed on the Australian Stock Exchange. The company is dedicated to the design, development and supply of Class I and IIa medical devices into the Australian and NZ market. Analytica's board of directors and management team offers a broad experience in biotech and medical technology including development, manufacturing, commercialisation, and finance. The company is focused on building shareholder value by applying these resources and expertise to the commercial development of viable and profitable medical devices. For over 35 years Atkinson Vinden has built a large portfolio of business clients, encompassing SME's, large corporations, property developers, not-for-profit entities and company directors. Particular industries focussed on include pharmaceutical and medical devices. AV Lawyers assists businesses with all of their legal needs including shareholder agreements, trust structures, commercial contracts, leasing and property acquisition and sale, mergers and acquisitions, franchising, business succession planning, ICT and intellectual property, disputes, mediation and litigation, employment and HR issues. AMSL is actively involved in many fields including Diabetes & Allergy. We import products mainly from the USA & Europe offering complete Sales, Marketing & Distribution services to all our principals. A provider of Quality Equipment to Health Care Professionals operating in the Dermatology and Skin Cancer fields. We proudly support and represent large, well - respected European and USA Manufacturers from a distribution and marketing perspective. C. R. Bard, Inc. is a leading multinational developer, manufacturer, and marketer of innovative, life-enhancing medical technologies in the product fields of: Vascular Urology Oncology Surgical Specialty BARD markets its products and services worldwide to hospitals, individual health care professionals, extended care facilities, and alternate site facilities. BARD pioneered the development of single-patient-use medical products for hospital procedures; today BARD is dedicated to pursuing technological innovations that offer superior clinical benefits while helping to reduce overall costs. Bausch + Lomb is one of the best-known and most respected healthcare brands in the world, offering the widest and finest range of eye health products including contact lenses and lens care products, pharmaceuticals, intraocular lenses and other eye surgery products. Over the last 150 years, Bausch + Lomb has become a global hallmark for innovation and quality. Our mission is simple yet powerful: Helping you see better to live better. Every day, millions of patients and caregivers rely on Baxter’s leading portfolio of critical care, nutrition, renal, hospital and surgical products. For more than 85 years, we’ve been operating at the critical intersection where innovations that save and sustain lives meet the healthcare providers that make it happen. Baxter ANZ has over 40 years of local experience and expertise in the medtech sector. With manufacturing facilities based in western Sydney and pharmacy operations in almost every state, Baxter is an industry leader in local innovation and healthcare solutions. One of the world’s leading manufacturers of cardio and endovascular medical devices, BIOTRONIK is headquartered in Berlin, Germany, and represented in over 100 countries. Several million patients have received BIOTRONIK implants designed to save lives and improve quality of life. BIOTRONIK has three core areas of business that aim to save lives and improve quality of life; Cardiac Rythym Management, Electrophysiology and Vascular Intervention. Bizcaps Software specialises in rapid-deployment business process management (BPM), software connecting people, processes and information across organisations. Bizcaps also specialises in product (PIM) and master data management (MDM) software, incorporating industry-leading plug-in functionality for simple integration with ERP and industry-specific systems. Brainlab develops, manufactures and markets software-driven medical technology, enabling access to and consistency of advanced, less invasive patient treatment. Our multilingual team has class leading expertise to deliver exceptional value to our clients. We provide strategic guidance and comprehensive support to commercialize medical technologies in all major international markets. Our integrated approach to regulatory affairs, quality, post market surveillance, health economics and reimbursement ensures that we can navigate the entire pathway to the full commercialization of your technology. Our deep expertise with a flexible, strategic approach and a commercial focus means we never lose sight of your objective - market access. Cancer Care Associates is committed to the provision of excellence in Cancer Care by providing world-class state-of-the-art facilities that deliver multidisciplinary care in a comfortable serene nurturing environment. Patient care is delivered by our team of highly skilled medical professionals who have a proven track record of innovation and clinical leadership, using the latest in technology and treatment protocols. Certification Body Australia (CBA) is an independent certification body for safety of electrical and electronic devices. We also provide regulatory and quality management system assistance to start-up medical device companies and inclusion in the ARTG services. Circuitwise Electronics (formerly Tresmine) has been in business for over 25 years under the same private ownership. With a strong focus on Quality and traceability Circuitwise holds both ISO9000 and ISO13485 Medical Certifications. Circuitwise owns some of the most advanced manufacturing equipment in the industry capable of handling the simplest to most complex of PCBs at any stage of the product life cycle from prototype to full production runs. Currently producing Medical products for Australia's leading Medical Companies. Circuitwise has extensive experience in all areas of medical devices electronic manufacturing. CRC is an organisation that provides strategic medical affairs services to the pharmaceutical, device and healthcare industries throughout the entire product development life cycle. From pre-clinical to clinical, through to registration, reimbursement, commercialisation and beyond. ConMed are a global medical technology company that specializes in the development and sale of products and services that allow our physician customers to deliver high quality care and as a result, enhanced clinical outcomes for their patients. Since 1963 Cook Medical has worked closely with physicians to develop technologies that eliminate the need for open surgery. Today we are combining medical devices, biologic materials, and cellular therapies to help the world’s healthcare systems deliver better outcomes more efficiently. Headquartered in the United States, we also have manufacturing locations in Denmark, Ireland, and Australia. We have always remained family owned so that we have the freedom to focus on what we care about: patients, our employees and our communities. As a leader in orthopaedic innovation, Corin has pioneered a number of landmark orthopaedic developments since its foundation. We are proud that we have been able to improve the quality of life of thousands of patients around the world through these ground breaking products. Our talented and dedicated teams share a common commitment to deliver quality products and services to patients, surgeons and healthcare providers which exceed expectations and positively impact their lives. Covance Inc., a global contract research organization (CRO), is the world’s most comprehensive drug development company, dedicated to advancing healthcare and delivering Solutions Made Real® by providing high-quality nonclinical, preclinical, clinical and commercialization services to pharmaceutical and biotechnology companies to help reduce the time and costs associated with drug development. Culpan Medical is a privately owned business. Culpan Medical serves the needs of healthcare professionals and organisations with the timely supply of medical devices that offer patients the best prognosis. We are committed to important future developments in technology that enhance patient outcomes and provide viable, sustainable solutions. Our mission is to provide patients and medical professionals with the best healthcare solutions available worldwide. Driven to provide clients a competitive edge, and connected to the communities where its clients want to do business, Dentons knows that understanding local cultures is crucial to successfully completing a deal, resolving a dispute or solving a business challenge. Now the world's largest law firm, Dentons' global team builds agile, tailored solutions to meet the local, national and global needs of private and public clients of any size in more than 170 locations serving 70 countries. Clients benefit from access to top-tier legal talent with experience in 24 sectors and 40 practices, including Medical Technology. For over 20 years, Device Technologies has been pioneering possibility in the Australasian healthcare landscape - seeking out and bringing to market, some of the world's most advanced healthcare products. We are now Australasia's largest independent provider of total healthcare solutions, with a comprehensive range that extends from high quality consumables, to advanced equipment, robotics and fully digital O.R.s. In partnership with some of the world's most innovative medical companies, our dedicated team of over 700 highly skilled healthcare specialists and support staff, are dedicated to providing superior outcomes for our customers and their patients across the entire healthcare community. DHL is present in over 220 countries and territories across the globe, making it the most international company in the world. With a workforce exceeding 350,000 employees, we provide solutions for an almost infinite number of logistics needs. Edwards Lifesciences is the global leader in the science of heart valves and hemodynamic monitoring. Driven by a passion to help patients, the company partners with clinicians to develop innovative technologies in the areas of structural heart disease and critical care monitoring that save and enhance lives. For almost five decades, Elekta has been a leader in precision radiation medicine. Our nearly 4,000 employees worldwide are committed to ensuring everyone in the world with cancer has access to – and benefits from – more precise, personalized radiotherapy treatments. Headquartered in Stockholm, Sweden, Elekta is listed on NASDAQ Stockholm Exchange. Elementum Advisory specialise in early stage and start-up companies who wish to commercialise their idea, raise capital, develop and execute a local or global business plan. We work with companies who are at an inflection point, where IPO, licencing, M&A and other strategies should be considered. Evolution Clinical (EC) was founded in 2017 in response to the changing needs within the Australian Medical Device Industry. Together with our team of highly experienced medical device professionals we provide unique, flexible and affordable Clinical Case Support options to enhance the clinical experience for our partners and their customers. In addition, Evolution Clinical offers specialised education and recruitment services to the Medical Device industry. Exactech Australia is a supplier of shoulder, knee, hip and ankle joint replacement implants and computer assisted surgery solutions for shoulders and knees. Exactech Australia is a subsidiary of Exactech Inc. (Gainesville, Florida, USA). Exactech was founded and continues to be led today by an Orthopaedic Surgeon, a Biomedical Engineer and an Organizational Culture Advocate. Dr. William Petty, MD., Dr Gary Miller, PhD., and Betty Petty started Exactech in Gainesville, Florida in 1985. Being Surgeon Focused and Patient Driven is baked into the DNA of the company. For us, it’s all about working together with surgeons, understanding their clinical challenges, then engineering innovative solutions. Five Corners is an Australian based Clinical Research Organisation headquartered in Sydney supporting the developers and distributors of medical technologies throughout Australia and New Zealand. We provide focused expertise in the areas of Clinical Research, Regulatory Consulting, Quality Management Services and Medical Writing. We are part of the Factory CRO Group offering our clients a tailored service to meet their global and regional needs. Fresenius Kabi is a global health care company that specialises in lifesaving medicines and technologies for infusion, transfusion and clinical nutrition. Our products and services are used to help care for critically and chronically ill patients. With our corporate philosophy of “caring for life”, we are committed to putting essential medicines and technologies in the hands of people who help patients and finding the best answers to the challenges they face. GenesisCare provides high quality specialist care to patients with cancer and cardiovascular disease, the two largest disease burdens globally. The organisation exists to improve quality and access for patients and communities in need. Grey Innovation identify existing IP and assess market needs and applications using global industry channel partners. to accelerate and de-risk commercialization. We fast fail process to screen and prove technology and commercial feasibility then spin out new companies, novate IP's and raise further investment. Grey develop, trial and certify the technology ready for sale and facilitate partnerships and acquisitions on exit. Grey bring strong expertise in Product Development, Manufacturing and Commercialization. Hologic (Australia) Pty Ltd is part of the Hologic, Inc. group of companies. Hologic is committed to enhancing women’s lives through earlier detection, improved diagnosis and less invasive treatments. Core business units are focused on mammography and breast biopsy, radiation treatment for early-stage breast cancer, cervical cancer screening, treatment for mennorrhagia, osteoporosis assessment, preterm birth screening, and mini C-arm and extremity MRI imaging for orthopedic applications. Horten Medical is a company providing both quality products & services to the healthcare industry. Our team is dedicated to the operating theatres within public and private hospitals & day surgeries. Horten Medical places dedicated focus to the operating theatre, providing quality solutions for patient positioning. We work closely with Surgeons, Nurse Unit Managers & theatre staff to provide products and services which ensure ultimate patient positioning is achieved for the success and ease of surgical procedures. Horten Medical understands the urgency required by surgeons and hospital staff, and we constantly strive to meet these requirements. Icon Cancer Centre is part of Icon Group, Australia’s largest dedicated provider of cancer care with a growing reach into New Zealand and Asia. Icon is built on strong but simple vision – to deliver the best care possible, to as many people as possible, as close to home as possible. Icon’s centres offer a combination of medical oncology, haematology and radiation oncology and invest in the latest technology and approaches to techniques for the benefit of cancer patients and their families. We love working together to build better futures. We are a group of entrepreneurs, designers and engineers that create new medical technology products and services that change lives and grow new organisations. Illuminate Health Consulting is an Australian based Health Technology Assessment, Health Economics and Health Outcomes consultancy with a unique and proven approach in the Australian and international environment. Our clients range from global pharmaceutical and medical device companies, to academic groups, and Government. Our clients engage us in projects undertaken in Australia, Asia, America, and Europe. Insight Strategy is a boutique public affairs consulting firm combining over 25 years’ experience, committed to providing strategic advice to assist clients meet their public affairs challenge. In an increasingly complex political, legislative and regulatory environment, understanding decision making processes, political risk and key influencers is increasingly important. At Johnson & Johnson Medical Devices Companies (JJMDC), we are using our breadth, scale and experience to reimagine the way healthcare is delivered to help people live longer, healthier lives. In a radically changing environment, we are making connections across science and technology to combine our own expertise in surgery, orthopaedics and interventional solutions with the big ideas of others to design and deliver physician and patient-centric products and solutions. As pioneers in medical devices, we continually focus on elevating the standard of care – working to expand patient access, improve outcomes, reduce health system costs and drive value. We create smart, people-centered healthcare to help the patients we serve recover faster and live longer and more vibrantly. We are in this for life. Johnson & Johnson Vision is a worldwide leader in vision care with a long history of developing, manufacturing and marketing innovative technologies. Our products and services address a wide range of vision disorders and meet the needs of patients throughout their life and around the world. Clyde-Apac are a specialist company in the field of air filtration and pollution control. From controlling the dust you can see right down to sub-micron particles, Clyde-Apac has the product range and the know-how to meet your requirements. LifeHealthcare was formed in 2006 and is one of Australia’s leading independent medical device distributors. Our strength lies in offering the scale of a multinational without being constrained by a single foreign parent company and our vision is to deliver innovative solutions in order to make a real difference to people’s lives. LifeHealthcare has an established presence in seven therapeutic channels providing implants, capital and consumable technologies. These therapeutic areas are Orthopaedics including Spine, Cardiology, Endovascular, Respiratory, Neurosurgery, Neurophysiology and General Surgery including Laparoscopy. LivaNova is a global medical device company and a leader in the treatment of cardiovascular diseases. With over 3,750 employees worldwide, the Company develops, manufactures and markets medical technologies for cardiac surgery and for the treatment of cardiac rhythm disorders. Each year, more than one million patients are treated with LivaNova devices in more than 80 countries. Our life-saving products are in more than 5,000 hospitals worldwide. 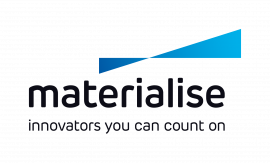 Materialise incorporates more than 25 years of 3D printing experience into a suite of software solutions and 3D printing services, that together form the backbone of the 3D Printing industry. Our open and flexible solutions enable all players in the ecosystem to build innovative 3D printing applications, that will make the world a better and healthier place. MED-EL, a leader in hearing solutions, is driven by a mission to overcome hearing loss as a barrier to communication. The Austrian-based, family-owned business was co-founded by industry pioneers Ingeborg and Erwin Hochmair, whose ground-breaking research led to the development of the world’s first micro-electronic multi-channel cochlear implant (CI), which was successfully implanted in 1977 and the basis for what is known as the modern CI today. MED-EL offers the widest range of implantable and non-implantable solutions to treat all degrees of hearing loss, enabling people in 117 countries enjoy the gift of hearing with the help of a MED-EL device. Medacta Australia is a Swiss company developing, manufacturing and distributing orthopaedic and neurosurgical medical devices worldwide. Medacta was founded in 1999 with a vision of redefining better through innovation for people needing joint replacement and spine surgery. Through medical education, our innovation leads to better results both for patients and healthcare system in terms of efficiency and economic savings. Medical Specialties Australasia was founded in 1982 and is 100% Australian owned. We provide the Australian medical market with a range of products for use in hospitals, private practice and for individual consumers. Medical Specialties Australasia has pioneered the introduction of many new medical and surgical technologies to Australia since 1982. MediGroup EBI is a medical and surgical device company founded in 2005. Evidence-based innovation is integral to MediGroup's business model. MediGroup EBI offer products that solve a wide range of difficult problems, with a therapeutic area focus into complex wounds, vascular, plastics, general surgery, neurosurgery and cardio-thoracics. Medtechnique is a Sydney based consultancy that helps companies access reimbursement for medical devices and technologies in Australia. Medtechnique Consulting can develop and implement a strategy for your product that will maximize the opportunities for successful market access and drive sales. Medtronic is a global leader in medical technology. Making healthcare better is our priority and we believe technology can play an even greater role in improving people’s lives. In addition to alleviating pain, restoring health, extending lives, we work in partnership with others to create seamless, more efficient care. We’re taking healthcare Further, Together. Mölnlycke Health Care is a world leading manufacturer of wound care and single-use surgical products and a service provider to the healthcare sector. Mölnlycke Health Care is one of the most respected professional healthcare brands in the world, and we are particularly known for our unique, high quality range of products and innovative, patented technologies that allow patients to live better lives and help health care professionals efficiently treat more patients to better care. MTPConnect is an independent, not-for-profit organisation formed as part of the Australian Government’s Industry Growth Centres Initiative. Its objective is to accelerate the rate of growth of Australia’s medical technology, biotechnology and pharmaceutical sector. MTPConnect has offices in Melbourne, Sydney, Adelaide and Perth. Nevro is a medical device company headquartered in Redwood City, California. We have developed HF10™ therapy, an innovative, evidence-based neuromodulation platform for the treatment of chronic pain. We started with a simple mission to help more patients suffering from chronic pain. At each stage of development, our research was subject to the highest levels of scientific rigor, resulting in a new therapy that has advanced the state of spinal cord stimulation (SCS). NL-Tec is particularly focused upon cancer treatment with Radiation in Australia and New Zealand. We feel privileged to be able to provide some support by sourcing high quality products and services that improve both the outcome and comfort for patients during treatment. From our founding as a 19th Century manufacturing company to our emergence as a 21st Century global leader in medical packing, our legacy has been one of innovative products and a commitment to excellence. Because one size doesn’t fit all, we bring the flexibility to meet the specific demands of each package required. We believe every healthcare product should be protected with the same care that goes into its design and production. We look forward to talking with you about how we can help protect what you have taken such care to produce. Our purpose at Olympus is to make peoples’ lives healthier, safer and more fulfilling. We do this through innovation. As a technology pioneer, we design and deliver solutions across our Medical, Scientific, and Consumer divisions that make a positive contribution to society. Our products are used to capture images of our world from the microscopic to the panoramic. They’re instrumental in furthering scientific research, traveling inside the human body to help diagnose, treat and prevent illness, and documenting your life with artistic freedom. Our commitment to customers and our social responsibility are the cornerstone of everything we do. Olympus, Your Vision, Our Future. Open Sesame is a healthcare consulting company which specialises in health economics, funding and reimbursement for medical devices. We have been providing services to the medical technology sector since 2005. The company was incorporated in 2002 and is focused to dramatically improve vision correction surgery through innovative technology and evaluation-based research. Prospitalia hTrak is a Healthcare Information Management System that supports critical business processes of billing, purchasing and procedure cost reporting. Regulatory Concepts was established in October 1992 by Dr. Helena Dickenson. The operations of this professional consultancy have grown over the years to include the services of specialised and dedicated consultants providing a high standard of professional advice and services in the regulatory area. We have developed a quality system specifically targeted at the Regulatory Processes in Australia and we have been certified to ISO 9002 since September 2000. Smartways provides a comprehensive suite of logistics and outsourced services to meet the demanding needs of the medical and healthcare industries. We partner with medical device companies, hospitals, clinics, laboratories and other allied healthcare providers to fulfil complex operating needs in a simple and user friendly way. Smith & Nephew is a global medical technology company with a focus on repairing and healing the human body in three sectors: Orthopaedics, Endoscopy and Wound Management. Smith & Nephew supports healthcare professionals in their daily efforts to improve the lives of their patients. We do this by taking a pioneering approach to the design of our products and services, by securing wider access to our technologies for more customers globally and by enabling better outcomes for patients. Smith & Nephew have a strong foundation in ANZ, having been established in Australia in 1950 and New Zealand in 1953. Spectrum Surgical is an independent Australian owned company specialising in the sales, marketing and distribution of leading edge surgical and medical devices to health care professionals and hospitals. We offer innovative and groundbreaking solutions from companies of the highest quality, providing our clients with advancements in ophthalmic surgery, diagnostics and more. Stryker is one of the world’s leading medical technology companies and, together with its customers, is driven to make healthcare better. The company offers innovative products and services in Orthopaedics, Medical and Surgical, and Neurotechnology and Spine that help improve patient and hospital outcomes.. Since establishment in 2006, Surgical Specialties has grown to be one of Australia’s largest independent distributors of innovative medical devices to the Australian and New Zealand medical community. The business focuses on delivering high quality surgical products for Hip & Knee Arthroplasty, Infection Prevention, Pain Management, Specialty Orthopaedics, Spine and Operating Room Products. Surgical Specialties now have a team of over 70 people delivering specialised support, with sales offices throughout Australia and New Zealand. Our mission is to deliver innovative surgical solutions and excellent customer service to help our customers achieve best possible patient outcomes. In summary, this well-respected boutique consultancy offers a team of specialists each with decades of experience across all classes of Medical Devices, as well as pharmaceuticals industries. The SPD Company offers in-depth knowledge, guidance, hands-on support and training across Regulatory Affairs, Quality Assurance, Product Development and Project Management. The SPD Company have specialists in Regulatory Strategy plus well-honed skills in implementation. The SPD Company also offers expertise in pharmaceutical areas across generics and NCEs, Biologicals, OTCs and Complementaries. The University of Newcastle (UON) is a world-class university. Excellence in teaching, research and the student experience is the focus at UON. UON stands as a global leader in university education, with a reputation for high quality teaching and learning and exciting, contemporary academic programs, distinguished by a commitment to equity and excellence and to creating a better future for its regions through a focus on innovation and impact. TOMI Australia specializes in providing total solutions in medical equipment such as Proton Beam Therapy and Medical Imagin Equipment. TOMI Australia is also a trusted medical procurement partner for a global property development firm specializing in the construction of medical facilties. With almost 60 years of global experience and operating in over 50 countries, Tunstall Healthcare is a leading provider of connected care and connected health solutions. Tunstall offers a truly end-to-end solution, encompassing design and development, consultancy and service support, deployment and training and triage and monitoring services. Varian is committed to cultivating an environment that connects the entire oncology community. Our goal is to help every cancer care provider access the type of expertise, information and technology that enables smart, efficient, and high quality care globally. Known for our innovation and distinctive team culture, Gore work closely with healthcare professionals to solve some of the most complex medical challenges of today and tomorrow. Saving lives and improving the quality of life for patients is at the core of everything we do. This meaningful work gives purpose to our lives and inspires us to create solutions that make a difference in the lives of others. Our dynamic team culture fosters innovation and collaboration across our global network. The result is the creation of products designed to work in harmony with the natural anatomy and mimic healthy conditions. For more than 40 years, our level of performance has matched the performance of our medical devices–reliable, durable, and effective. As we move forward, we will continue to lead the way by raising standards and improving care for more patients, while providing viable options for more physicians, providers, and payers. Our devices include vascular grafts, endovascular and interventional devices, surgical meshes, sutures, and staple line reinforcement materials. With more than 40 million devices implanted worldwide, we are a world leader in membrane technology and biomaterials. Wright Medical Technology, Inc., headquartered in Memphis, TN, is an ISO 9001 certified manufacturer of specialty orthopaedic implants and instrumentation. Wright's product offerings include extremity implants for the foot, ankle, hand, elbow, and shoulder. We also offer both synthetic and tissue-based bone graft substitute materials. Since its inception, Wright has introduced a number of products that represent new standards in orthopaedic technology. From new material technologies to advanced products and instrumentation, Wright is committed to finding solutions that enable clinicians to alleviate pain and restore their patients’ lifestyles. Established in 1949, we are one of the top 100 universities in the world, with more than 59,000 students and a 7,000-strong research community. As a global university, we aim to have an impact on people’s lives around the world. UNSW is committed to making a difference through pioneering research and preparing the next generation of talented global citizens for career success. We believe our world is at a critical point in the advancement of humanity, and education and research provide a fundamental platform upon which social transformation can take place. Vision RT was founded in 2001 with a mission to develop pioneering technology for surface guided radiation therapy, with the goal of enabling patient comfort and enhancing treatment efficacy and efficiency. As the company has grown, it has been privileged to collaborate with some of the world’s leading cancer centres and equipment vendors. The company’s video-based tracking technology is quickly becoming established as standard of care in surface guided radiotherapy. With a non-invasive, non-ionizing approach, there are now over 1,000 installations around the world. Headquartered in London, UK, with offices in Columbia (MD) in the USA, and Hong Kong, Vision RT employs almost 200 staff around the world. With constant innovation and technology advances at its core, Vision RT is expanding its footprint around the world. Through sponsoring the SGRT Community and other educational activities, the extensive benefits of SGRT are rapidly being established as the Company aims to provide its world-class solutions to every cancer clinic around the world. By tracking the patient’s 3D surface in real time, our technology enhances patient comfort and safety and improves the efficiency of radiation therapy clinics. Widely used on all treatment sites, it particularly benefits left breast cancer treatment by avoiding cardiac damage, and aids comfort and speed during brain treatments. Zimmer Biomet has been based in Warsaw since it was founded in 1927. Today, Zimmer Biomet has operations in more than 25 countries around the world and sells products in more than 100 countries. Our global team designs, manufactures and markets effective, innovative solutions that support orthopaedic surgeons and clinicians in restoring mobility, alleviating pain and improving the quality of life for patients around the world. Our musculoskeletal technologies and a wide range of related products and services make us valuable partners to healthcare providers in more than 100 countries. We're building on a strong history of success to enhance the value we provide to healthcare providers and their patients. Zimmer Biomet maintains world-class scientific facilities and resources and collaborates with leading clinicians and researchers around the world. We share a commitment with healthcare providers to find the best technologies, treatments and solutions to deliver high quality, cost-effective patient care.